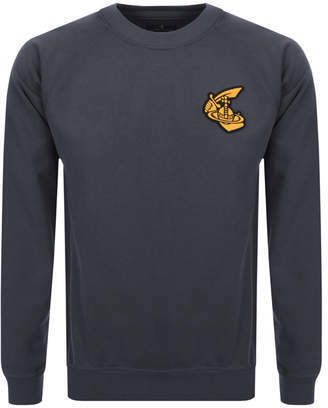 Vivienne Westwood Classic Orb Badge Logo Sweatshirt In Anthracite Grey, A ribbed crew neck with ribbed cuffs on the long sleeves and a ribbed waistband. A signature Vivienne Westwood Orb Arm And Cutlass logo is on the left of the chest in black and yellow chenille and a woven CHAOS logo pinch tag is in the left side seam in black and yellow. 100% Cotton. Part Of The Vivienne Westwood Collection Of Basic Knitwear, Jumpers And Cardigans Live Online.